This is a bit of a cheat, as this isn't really from Lost Wages, NV, but Las Vegas, New Mexico...oh, that Las Vegas I'm sure everyone is thinking. I have a collection (surprise!) 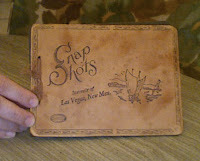 of vintage souvenir scrap and photo albums. I especially like the 'loving hands at home' type, but this leather bound one is quite nice too. It's Genuine Leather, Made in USA by the Mayflower Company. If you are interested in the points of interest in Las Vegas, NM (and who isn't), check this out.